Pat’s theme this year, 'Out of This World!' is full of fun space tips and in April we have some space things that are silly but create memories! The block pattern download is further down the page after Pat tells you about the inspiration for this month's block down below. PLEASE NOTE: The supply list for this year's BOM has changed, as one of the fabrics went out of print, so if you haven't already downloaded the update, click the link below and you can get it. The supply list and blocks during the year will always be found at our landing page for the Mystery. The five prior years are also still available at the ‘Mystery BOM’ tab above. CLICK HERE for the Project Page if you are just joining us or to download the supply list! At the end of our posts each month we showcase two amazing quilt shops. You will be able to find new shops to visit on your travels. Also be sure to visit Pat’s page for additional tips, hints, information, and to enter your block for a chance to win her giveaway each month! 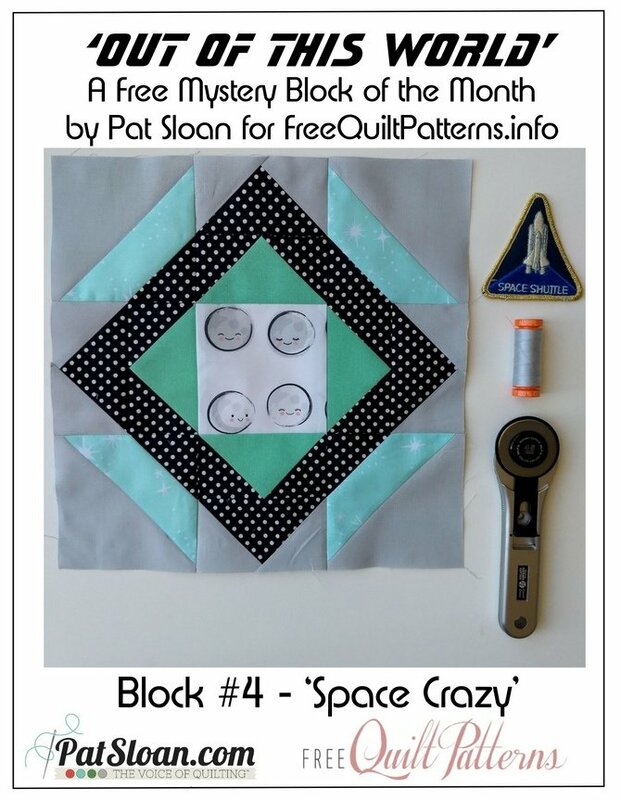 Pat Sloan About This Month's Block - Space Crazy Fun! I think there are periods of time were the whole whole world was super space-crazy. I think it comes and goes, but I secretly think we all want a little space fun in our lives. As a Party Theme? There are SO many cool options. From the decorations, to the type of food. Hello Moon Rock cookies, to the sparkly ceilings. This is a fantastic way to celebrate a birthday, anniversary, or a baby shower! Now we need to hope for a space-themed baby room. Check them out at Pinterest, now I want to light up my ceiling! Did you know you can find 'space theme' sneakers? 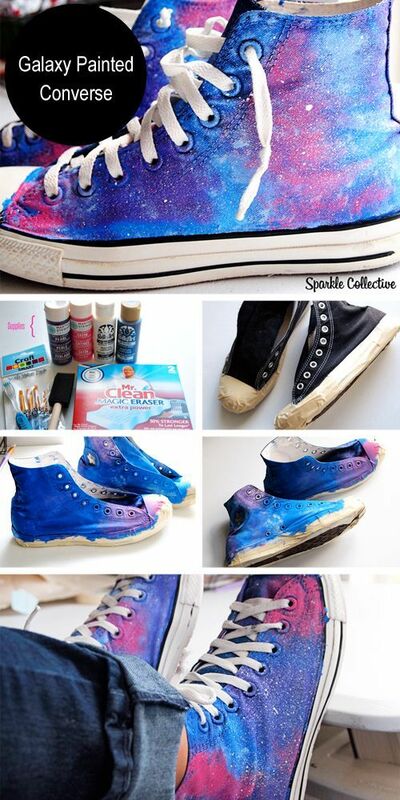 Or do a little DIY on a pair of your own. This would be a fun way to spiff up a pair of kicks. Years ago I painted many a pair of white sneaker. This link has a TON of DIY space ideas. Space On things... like... lunch boxes! Lunch boxes have always been a way to show what we love. I was all over the place with mine. 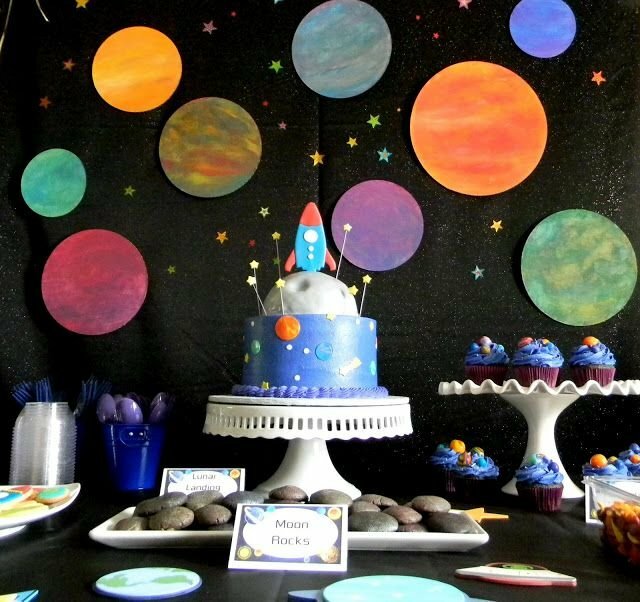 From Strawberry Shortcake to space themes! 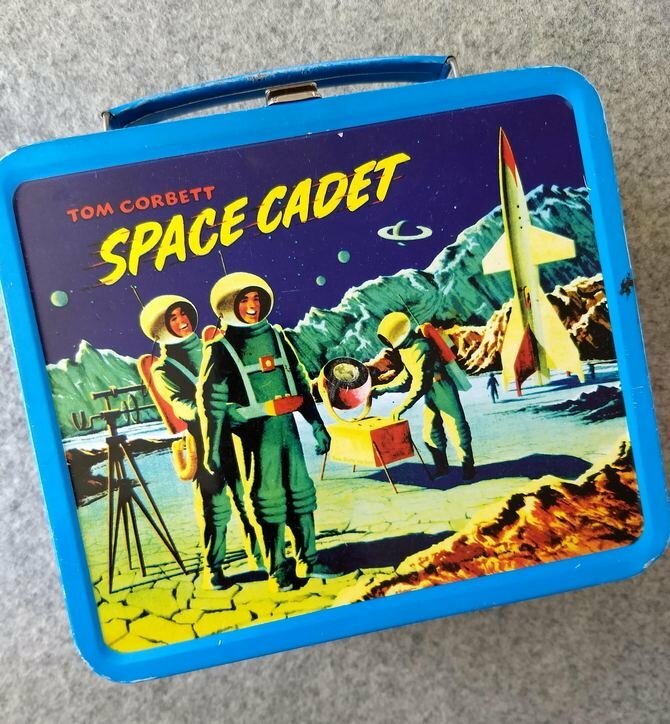 This is my Tom Corbett Space Cadet lunch box. I still love the graphics on it. Learn more about good ole Tom here. Each month I’ll share a quote about space, it’s fun for me to look for them! And click here for the full layout so you can start sewing blocks together! 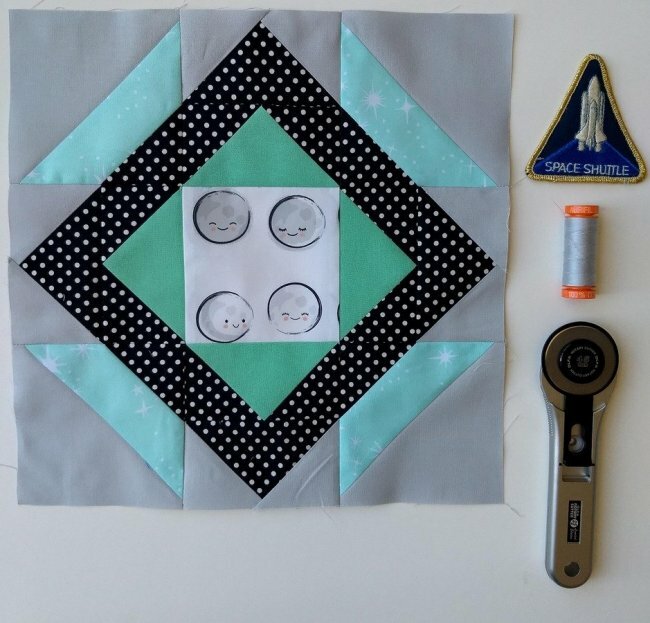 ** CLICK over to my website to add your block to my quilt show on my website, you might be my monthly random pick to win a prize! Meet another set of GREAT quilt shops this month! Once you download the block, visit them, it’s so fun to find new quilt shops to visit! Located in downtown New Hampton, Iowa, Quilter's window is housed in a historic building that represents the nostalgic charm of a by gone era (locals know it as the the old JC Penney building). With large display windows and a spacious interior, there's plenty of bright lighting and elbow room to leisurely browse our stunning selection of designer fabrics from Moda, Hoffman, Andover, Maywood, Henry Glass, Northcott, Robert Kaufman, Windham, and Willmington Fabrics, to name just a few. You'll also find all the notions, patterns, books, tools, kits, and more, to make your quilting experience more efficient and enjoyable. As an authorized dealer for the innovative PFAFF brand, we carry a full range of sewing, embroidery, and serger machines in a variety of models and price ranges to meet your individual sewing and budget needs. We offer a variety of classes for all skill levels, taught in a casual, no-pressure environment by friendly instructors who are dedicated to guiding you through your quilting journey. Around here, we believe anyone can learn the time honored skills of sewing and quilting with the right tools, encouragement, and support. That's why we go out of our way to provide you with the products and services that will open the window to your creativity and help you succeed in all you quilting endeavors! At Golden State Quilting you will always find the right tools, fabric, classes and service to help you start and finish quilting projects of any size. We specialize in Kaffe Fassett, Batiks and modern fabric. Our experienced staff will help you pick the perfect fabric for your special quilt. Have you always wanted to learn to quilt? Are you looking for new ideas? How about a fun technique class? We have a wide variety -- from an four-week Beginning Quilting 101 class to monthly Sunday brunches, bag and paper piecing classes. You will find all of our classes listed on our calendar featuring class descriptions and pictures of our class projects. Do you have a quilt top that is ready to be quilted? We can do that for you on our computerized long-arm machine. We offer a large selection of patterns to choose from whether traditional or modern design. We also offer expert sewing machine service and repair. We are located in the Cinelux Shopping center - just 3 miles from Santana Row (outstanding shopping and Five Star dining) as well as the Historic Winchester Mystery House. It's a perfect location where we just "aren't that far away from anything"! Who could ask for more? Are you loving our Out of This World theme this year? Leave me a comment below telling me about your favorite 'space crazy' experience!